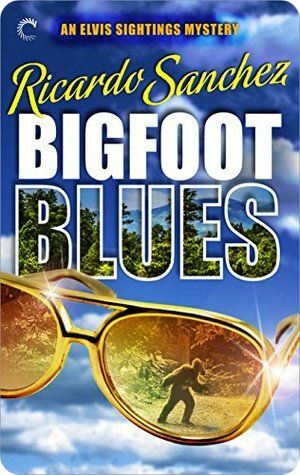 Let me tell you a little about a funny, quirky cozy mystery I just read, Bigfoot Blues by Ricardo Sanchez. 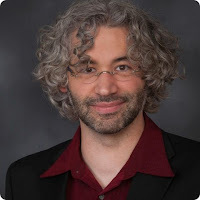 Bigfoot Blues stars (and is narrated by) Floyd (no last name, because it's unpronounceable), a private investigator in Pocatello, Idaho who is such a big fan of Elvis that he is doing the Lifestyle Elvis thing. Floyd seems to be more into the Elvis lifestyle than Elvis himself was, in that Floyd wears flashy sequined jumpsuits (sometimes with capes, even!) all the time. Didn't Elvis save the sequins and capes for his performances? And aren't private investigators supposed to be at least somewhat unobtrusive? "Will you be parking a car with us?" "Yeah, it's the old Camaro out front," I said, pointing out the lobby windows. "Is it supposed to be on fire?" the clerk said calmly. "I'm a private investigator, not a tribute artist," I said. "Then why the hell you dressed like Elvis?" he asked. I replied with a line I've probably spoken a thousand times. "I'm a Lifestyle Elvis. I try to live my life the way Elvis did. 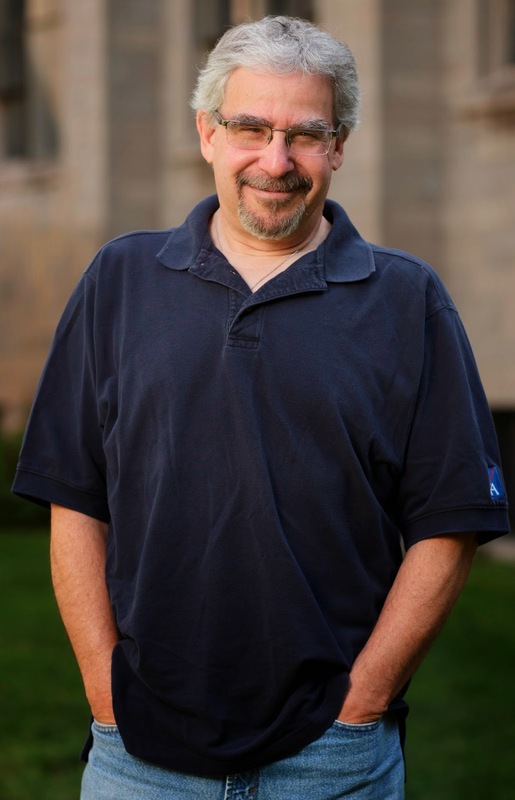 Part of that involves wearing the jumpsuits." The one I had on today was turquoise with an owl pattern on the back and black beaded bird wings on both breasts. "That's the nuttiest thing I ever heard of," the sheriff said. "Hey, why are you wearing that thing, anyway?" "I'm a lifestyle Elvis. I live the way I think he'd want me to, and part of that is wearing the jumpsuit," I explained. "You're hanging out in a cemetery trying to get lucky with Sasquatch." I enjoyed reading about all of the trouble, oh they got trouble, right there in River City, with a capital "T" that rhymes with "B" and that stands for Bigfoot Blues. There are plot twists galore, what with the multitude of women either allegedly married to Bigfoot or eager to become BoBs (Brides of Bigfoot), the cryptotaxidermists and their creations, rumors of a chupacabra on the loose, a mysterious pharmaceutical company on the outskirts of town, and even possible government cover-ups. I was totally surprised by whodunit. I think you will be, also! 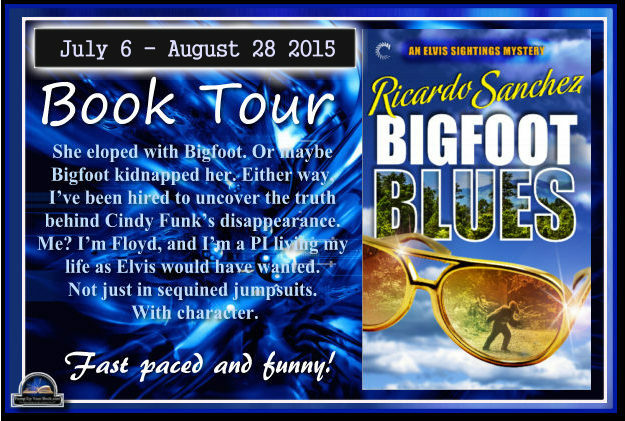 If you are looking for something that's a little different, a quirky mystery with lots of laughs, especially if you're an Elvis fan, I think you'll really like Bigfoot Blues by Ricardo Sanchez! Note: I received a complimentary copy of Bigfoot Blues in exchange for my honest review. Elvis Sightings, the first novel in his Elvis Sightings Mysteries series, was released in September, 2014. Bigfoot Blues, the follow up, was released in May, 2015.